Passwords are a necessary evil. Around this time, everyone has a stack of passwords and has developed ways of dealing with them. Unfortunately, many deal with multiple passwords by making them shorter and easier to remember. This is not good. Using simple to use “desktop software”, passwords can be cracked in almost no time at all. Below is the time need to crack your password using a single desktop computer. 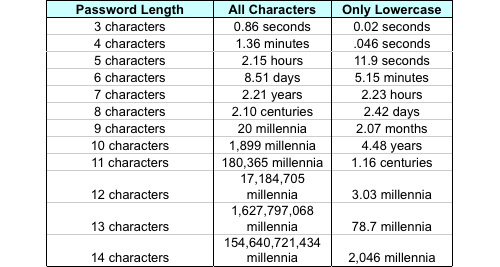 The scary part is that most password crackers do not use a single computer but rent out server farms dropping the times down by 10X – 100X. Need a solution? Check out KeePass. A simple to use free utility that encrypts your passwords into a single file that can be carried/stored. The time you take to learn a real password manager and use pseudo random passwords will pay off in the future when your bank account/hotmail account doesn’t get hacked. I have two clients who have had their email account hacked. It may not seem like a big deal but the email account had passwords, personal data and was used to send emails to their business clients with links to malware. This caused their clients to become infected with virus’ from their email account….Not a good way to impress your clients. What do you use for your password managing?